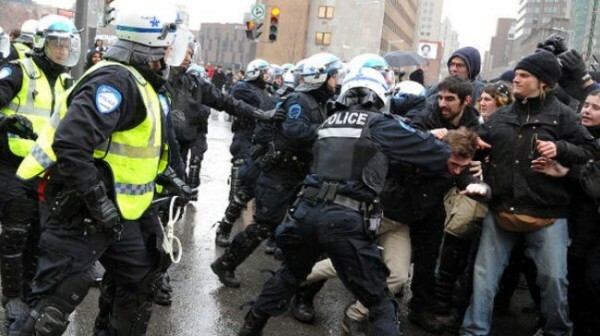 Canadian authorities have detained more than 240 people protesting in Montreal against police brutality on the 15th of March. Around 500 people gathered on Friday to participate in the 17th annual anti-police brutality march. Police reportedly used horses, pepper-spray and controversial kettling tactics to disperse protesters. “Before the march even began, they just ran to the crowd for no apparent reason and then since there was chaos they took that as a reason to just charge into us with their batons and shields,” said one protester. Police declared the march illegal as organizers did not provide authorities with an itinerary. Of those detained, more than 150 were fined CAD 637 for violating municipal bylaws and 12 others were arrested for various criminal acts. According to authorities, at least six people, including four protesters and two police officers, received minor injuries. The orginal article can be found on the PressTV website, here.